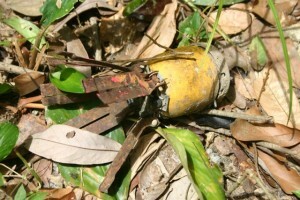 We find bomblets that have been associated with many child fatalities. This video explains why the BLU 3-B is so dangerous. Pre school children who have never had a store-bought toy or, are hungry,are attracted to the brightly colored BLU 3-B, mistaking it for food or a toy. Over recent years there has been a reduction in the number of accidents with UXO. That welcome change has been the result of great effort to raise public knowledge about ordnance and to teach villagers what actions might lead to an accident. The reduction of casualties has occurred over most age cohorts: school-aged youth, teens, young adults, the middle aged, the elderly. Sadly, one cohort remains more at risk than the others: pre-school children—no doubt because they are a group that is rarely assembled as a group for instruction. But, perhaps more significantly, because they are harder to teach risk education concepts and they more inclined toward impulsive behavior than any other age group. In this video, we example a particular cluster bomblet that has been associated with many child injuries. It’s the bight yellow bomblet we call the “BLU 3-B” (Bomb Live Unit). On several occasions, I’ve seen unsupervised children pick up this bomblet, and each time their parent has explained, “Sorry Mr. Jim. He thought it was fruit”. Check out our new video and see how we deal with this bomblet.